Happy Valentine's Day Helps You Get One on One With Your Loved Ones - Contest for Free Software Bundle! Twinkler Software has brought us a new app just in time for Valentine's Day. 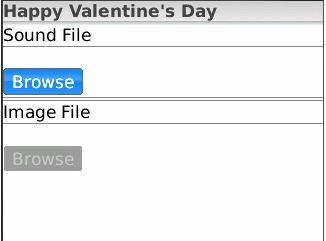 Happy Valentine's Day is integrated into your device's options menu. Upon opening, you select an image, audio file, and save. The next time you open the app it will display your image, while playing your preselected audio in the background. This is when you pass the device on to your nearby sweetheart, promoting that "one on one interaction". Happy Valentine's Day is available for $0.99 for all devices running OS 4.5+. Contest: Twinkler Software in conjunction with Toysoft are sponsoring a Valentine's Day contest which will end this Sunday at Midnight PST. 4 lucky winners will win the ENTIRE catalog of Twinkler Software apps, as well as their choice of 8 apps from Toysoft for themselves or their sweethearts! Please only leave one comment, multiple entries won't count.